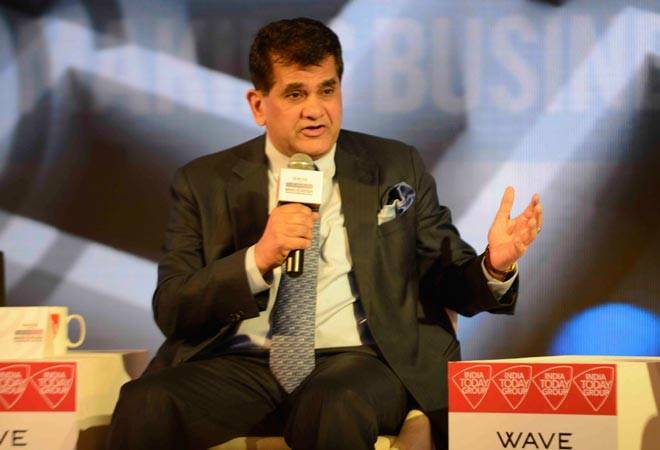 For India to become a 10-trillion dollar economy and to grow at 9-10 per cent, it was imperative for the government to take some bold steps to move towards a less-cash digital economy, and demonetisation was the way forward, Amitabh Kant, the CEO of Niti Ayog, told the august gathering at the Business Today flagship event, MindRush. Demonetisation would pave the way for financial inclusion and brining the black money back into the formal economy. However, he added that demonetisation should not be seen in isolation, as it is a part of a series of measures that has already been taken by the government, and a transitory step towards a digital economy with many more reforms, including tax reforms, which are still in the works. He also said that demonetisation cannot be looked as a tool to weed out corruption, or other ills of the society. According to Kant economic growth might be hit for two quarters, but India is not a corporate entity that has to just go by quarterly growths. "India is a nation and nation must have a long-term view... look at where will India be 30 years from now" and the short-term pain is worth the long-term gain. The banks are getting healthier, inflation will lower, and tax rates shall go down. "It will take India to a new normal." Kant said demonetisation was a radical step in the right direction and the opposition from celebrated economists was a wee bit too soon. "Given the scale, it is the first time an excisise of this scale has been carried out. It is a radical measure never taken in any country. There is no real example or empirical evidence for them to base their assumptions on." He reiterated that without disruption a country cannot grow. "Only 1 per cent pay taxes in India, large-scale money evasion due to the cash economy and a digital push will help curb the black economy and help grow the formal economy. This would further lead to money going into key areas such as health, education and rural areas." Kant also hinted at more tough measures from political funding and tax reforms to real estate reforms. "These are all logical consequences to increase ease of doing business, increasing transparency and accountability." He said that the government is incentivising people to move towards digital transactions by offering cash backs, incentives and weekly and monthly draws. "Psychological barrier from cash to digital needs to be broken. We are targeting larger volumes and lower transaction costs... Soon digital will be less costly or at par with cash transactions." "It is important for people to look at it as a long-term measure, and not a short-term knee-jerk reaction for short-term gains. The government is keeping a close watch on each and every development at the ground level, almost on a real-time basis, and is modifying the rules as and when necessary to make it easier for the public. The government hopes that the cash crunch will not exist beyond 15-20 days, but all of you must also realise that if the same amount of currency is pumped into the system, more the chances of the black economy to revive," Kant signed off.